The better way to grip skis for shop work or home use. Ski is held in center by means of an adjustable sole that automatically retracts the brake when inserted in the binding. Edge and base remain fully exposed for unobstructed access. Includes vertical clamps. 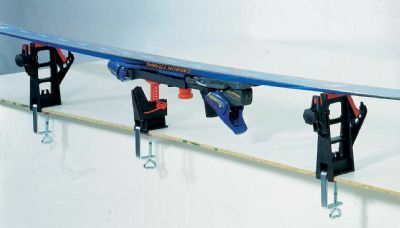 This clamp method eliminates problems with cap skis and provides tighter and gentler retention of ski, without danger of clamp marks or scratching. Flat, vertical or 45 � working positions give you optimum tuning angle. Comes with binding adapter for use with XC-skis. Tall enough to work with lifted skis. Comes with mounting clamps and is predrilled for permanent mounting.